Promising that guests will “come back new” after cruising with its innovative ships, Princess Cruises guarantees that all its itineraries and every ship in its fleet deliver unparalleled relaxation. Helping you do as much (or as little) as you’d like, Princess Cruises’ amazing cruise packages give you the freedom to partake in cultural excursions or just lounge around the onboard swimming pools, soaking up the rays. With more than 950 voyages to choose from, it is no longer a question of if, but rather “when?” and “to where?”! A Princess MedallionClass holiday ensures for an unforgettable onboard experience thanks to the award-winning OceanMedallion – Princess Cruises-exclusive wearable technology. Whether you wear it as a bracelet, necklace, or clip, or just slip it into your pocket or purse, the OceanMedallion will reward you with more time to enjoy your personalised holiday. Not only does it open the door to your stateroom, but the OceanMedallion will also open doors to incredible holiday possibilities. Guests with the OceanMedallion enjoy priority check-in; easy onboard payments with a touch of the Medallion; Medallion Net, the best Wi-Fi at sea; and much more! Includes Los Angeles Hotel Stay , Includes Discounted Flights! , Other dates available from Oct 19 - Jan 20! 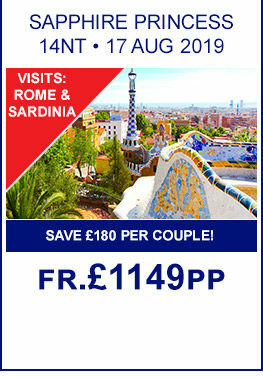 Includes Discounted Flights! , More Dates Available From December 19 - January 20! Includes Los Angeles Hotel Stay , Includes Discounted Flights! Includes San Francisco Stay! , Includes Discounted Flights! , More Dates Available From Dec 19 - Feb 20! Includes 1nt Los Angeles Hotel Stay! , Includes Discounted Flights! Includes 2nt Brisbane Stay! 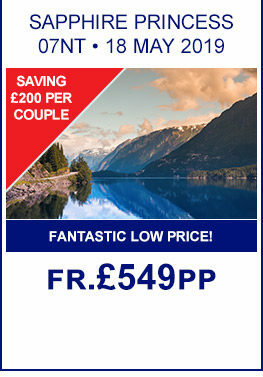 , Best Value Cruise To New Zealand Ever , CALL TO BOOK NOW FOR £0 DEPOSIT!! Includes 2nt Hotel Stay in Sydney! , Add Nights In Singapore From Only £59pppn , Extend Your Stay In Sydney From £89pppn , CALL TO BOOK NOW FOR £0 DEPOSIT!! FREE 5* Accomodation in Singapore & Perth! , Includes Singapore City Tour! , Includes Swan River Cruise in Perth! 3 Day F1 GP Ticket and Entertainment , Includes Hotel Stays in Hong Kong & Singapore , 2nts Sydney stay & FREE Tour! Add Nights In Singapore From Only £59pppn , Add Nights in Hong Kong From £59pppn , Includes FREE 1nt Hotel Stay In Singapore! Includes 2nts Sydney stay! , Includes Singapore City Hotel Stay! 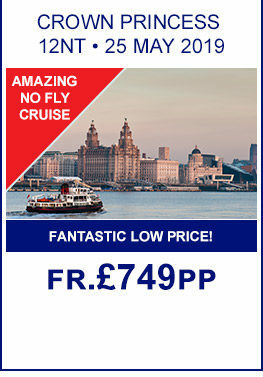 No Fly Cruise , BOOK NOW FOR ONLY £50PP DEPOSIT! 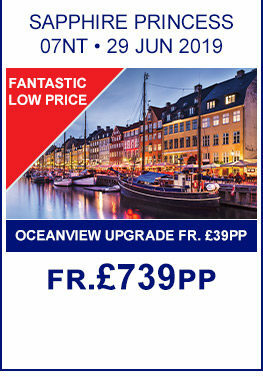 No Fly Cruise , Includes New York & Nova Scotia , Overnight In Edinburgh , BOOK NOW FOR ONLY £50PP DEPOSIT! Many more dates available from October 2019 to March 2020! Includes Hotel Stay In Fort Lauderdale , Many more dates available from October 2019 to March 2020! Includes Hotel Stay In Fort Lauderdale , Also available February 2020 and April 2020! BOOK NOW FOR ONLY £50PP DEPOSIT! Regularly voted the best cruise line for itinerary choice, Princess Cruises pride themselves on offering an incredible array of different experiences and opportunities for their guests, including ship classes such as Caribbean, Grand, Royal and Sun. Alongside round-the-world itineraries, Princess Cruises offer a wonderful selection of cruises through Europe, the Americas, Asia, and the South Pacific. From the awe-inspiring coastlines of Alaska to the pristine beaches of the Caribbean islands, Princess Cruises can take you almost anywhere.